Marketing a law firm is a daunting task and often I have been asked by lawyers, just where and how should they start – as the number of options and types of marketing are overwhelming. I decided to share just 7 ideas to get a law firm off to an effective marketing campaign. What do you want from this marketing effort? How often should you drive marketing? Who do you plan to target in your marketing? Where should you market your law firm? Marketing that costs zero, null, nada, zip, nothing. 1. What do you want from this marketing effort? Yes, we all want more clients and billable work, but we need to narrow this down so that we can address on a very focused segment of our business and we can track the success of our hard work and well-earned money. For example – We want to attract 20 new leads for our family law department in the next 60 days, and want 4 of those leads to become paying clients. Make sure you have a cut-off date, have actual figures that you expect and what aspect of your law firm you are marketing. How long is a piece of string!? This is always a difficult question to answer, but the only advice I could offer here is to start small and controlled, make sure you measure the spend and the return you get for the work. Getting in a marketing consulting firm is going to be more expensive than doing it yourselves, but I almost guarantee you will get a faster and more professional campaign from a consultancy. If you are going to do an Adwords campaign on very dedicated and focused keywords, and you monitor it very closely, you will probably spend between R500 and R2000. It is important to put a peg in the ground here – specify exactly how much you are willing to spend and make sure it does not carry on unless it is successful, otherwise stop it and go back to the drawing board to create a new campaign. 3. How often should you drive marketing? This all depends are how, where and what you are marketing, but make sure it continues with the same frequency that it started with. If you are going to use social media and post 3 topics per day to your Facebook page, make sure you continue to do this throughout the campaign. If you are going to place an ad in the local community paper every week for 8 weeks, order it up front and make sure everything is done up front, so that there is no chance of it falling by the wayside. On the larger picture of how often you should market your law firm, ALL THE TIME. You should always have a marketing campaign running to get you additional business. Keep track of what you spend, make sure you have a peg in the ground on the spend and don’t leave marketing campaigns to run on without daily supervision – especially on Adwords adverts, a badly setup and unmonitored Adwords campaign could easily spend R5000 in a day. If you are going to monitor the number of calls you get from a campaign, make sure the person taking the calls, quantifies where the caller got your details and that it is recorded. Unless you know where your prospects came from, there is no way to measure your success and no way to fix your campaign source. Wherever possible, implement systems to measure your campaigns – for example Google Analytics to see how many people opened a certain webpage on your law firm website – there are also ways to measure your conversions from people taking a certain action. The simple fact is…If you cannot measure your marketing, don’t do it! 5. Who do you plan to target in your marketing? Unless you know who you are marketing to, how do you know what to promote and where to advertise? 6. Where should you market your law firm? The reason you pay attention to who you are marketing to above, is so that you have a better idea on where to market your firm. If you were promoting antenuptial agreements, you would not advertise in a home for the aged, you would focus on places like social media, community newspapers, youth radio stations, hip and happening magazines and trendy restaurants. You focus on where and what your target market are doing and then find ways to market inside of those events/publications/venues. One of my favourites is the community newspaper – they don’t cost a lot and they are hungry for business and content – good content from legal professionals are always welcome. Check the way people contacting your firm are being treated – how the phone is answered, how quickly people return calls, how quickly your staff reply to emails, how are they greeted and treated while in your reception area. Find online business directories where you can add your firm information. Start with the ones that list law firms. Most of the legal profession directories require some sort of payment, however there are a few with free listings and most business directories are free. Check how your firm is listed with Google Business (https://www.google.com/business/) – add it if it is not already there and make sure the information is correct. Ensure your Facebook page for the law firm is up to date and post a topic at least every month. You can do way more with Facebook, but the bare minimum is doing the above. Ensure your LinkedIn profiles are up to date. Contribute to blogs that you know your target market will be interested in. Also, offer your services to local news outlets in your area. Use hand-written cards to congratulate people. Extend this to your paralegal staff, as they will increase the number of people you get to. Ask your staff to promote your firm to their friends. Update your website and make sure you have proper call to action items on your pages. Get involved with business networking groups for your area. Analyse and improve your email signature – first it should be consistent across the firm, but it should look professional and if possible promote your services. Get involved with a charity, and actively promote it on your website and social media pages. The more active you are with the charity, the more exposure your firm will get, a bonus to you helping people in need. Start a blog and offer advice to people in difficult situations. Use these blog articles to feed your Facebook and LinkedIn activity. Do follow up calls to your clients after the work is complete and thank them for the business, not only will they appreciate the call, they may give you service improvement ideas for your firm. Refer business in and amongst your friends and business network, they will remember you when they next need a law firm. As you can see, marketing does not have to cost a fortune, if tackled correctly and with a touch of planning it can become a brilliant source of new business. 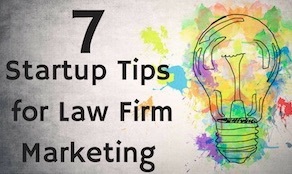 I hope these 7 ideas help you market your law firm more effectively.